Wait. How do I use my iPhone to fix my car? Which OBD2 app should I use for my iPhone? How can a WiFi OBDII scanner save me money? Hello! Mike here from ScannerAnswers.com to bring you our list of the cheapest and best OBD2 iPhone Scanner. These OBD2 WiFi scanners will really let you put your Apple smartphone to good use. Have you ever wondered why that Check Engine light is on? Well pick yourself up an OBDII scanner for iPhone, connect it to your OBDII port, and start pulling DTC’s or Diagnostic Trouble Codes without paying big money at the dealership. From there, you can see if it’s going to be a simple mechanical fix that you can do yourself, or if it’s time to visit your friendly neighborhood mechanic. You’ve read this far, now it’s time to get into it. Here are the 5 best OBD2 iPhone scanner choices for 2017. For this test, we decided to use a couple of our family and friend’s cars: a 2009 Toyota Corolla, 2000 Honda Civic with the B16 engine, and a 2005 Ford F-150. Officially licensed and certified for Apple and Android devices – live data – Read and Clear Enhanced Codes – Utilizes Bluetooth so you don’t have to mess around with WiFi connections! There is a reason why the Bluedriver is a bit more costly compared to other wireless OBD2 scanners. It is trusted by mechanics and developed by professional engineers, and it is officially licensed and certified for Apple and Android devices. Yes, this device will also work on Android just in case you own one of those phones or tablets too. ? We hooked this device to our test Civic and it immediately diagnosed a faulty MAF sensor, which we knew in advance. But that’s not all: it also diagnosed a faulty cam sensor, which we found odd. We’re hobby mechanics here, but isn’t it cool to know that there are probably hidden faults in your car before they become real expensive issues? As it turns out, the car had an odd idling problem, which is usually felt when the engine is either too hot or too cold. It didn’t bother Kevin, who owns the flashy Honda. 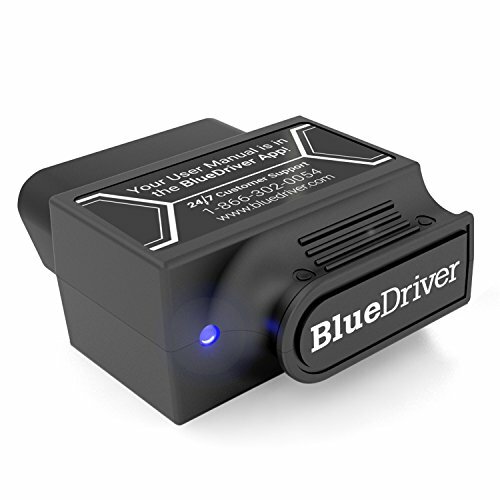 But now he knows what’s wrong with his car, and it made us a believer in the BlueDriver Bluetooth Professional OBDII Scan Tool. One more thing we love about the Bluedriver is their customer support team. Now I know what you’re thinking, “I don’t need no customer support Mike!” – Oh but trust me when I tell you that the Bluedriver support is the best that we’ve found. If you have any questions about their scan tool, you can call them at 866-302-0054 for 24/7 help. Try getting that with your cheap, $10 scanner. Yeah, no more guessing if you’ll be able to read the Enhanced DTCs now! Awesome seller support! 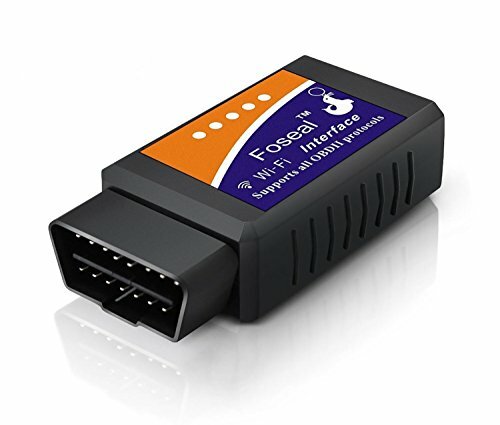 Instant access to view your car’s sensor data – Very Popular Scanner – If you don’t want a reliable but low priced adapter, get this one! Want an awesome scanner but don’t have the cash to fork over for the Bluedriver? This tool is a great alternative to the Bluedriver (and most other adapter), because it’s a great combination of low price and decent build quality. This Foseal supports all major on-board diagnostic protocols: ISO15765-4 (CAN), ISO14230-4 (KWP2000), ISO9141-2, J1850 VPW and J1850 PWM. It will work on your iPhone or iPad, and it will also work on your Android device. We think it’s an amazing tool for the price. This code reader can read and diagnose both generic and manufacturer-specific trouble codes and display current sensor data. We hooked this baby up to our Ford pickup, and it was able to reveal the faulty throttle sensor. Our only complaint is that the WIFI signal got weak if you got too far away from the car. But hey, most of us aren’t walking into the kitchen while trying to diagnostic our check engine light, right? ? Considering the price, we were really impressed with the Foseal Scanner for the iPhone. Of course, you will need to install a third party app for the device to work. DashCommand is one of the best OBD2 apps for the iPhone at the moment. If you are a tight-wad like Kevin is, you can use the free OBD Car Doctor which has less features, but still works well. Next up is the Veepeak Mini. I argued that this code reader should be the top because it’s one of the best OBD2 scanners that are compatible with the iPhone and other Apple products. However, the BlueDriver just barely beat it because the Veepeak is not “certified by Apple.” Don’t worry though! This scanner punches above its own weight class. Editor’s note: Make sure you select the “WiFi Version for Apple.” The WiFi version might cost a few dollars extra. There is a Bluetooth version available, but Bluetooth only works with Android phones. This device is compatible with all OBD2 compliant cars and light trucks sold in the US, and it also supports all five OBD2 protocols: CAN, KWP2000, ISO9141-2, J1850 VPW and J1850 PWM. That is good news for our ailing Toyota Corolla. 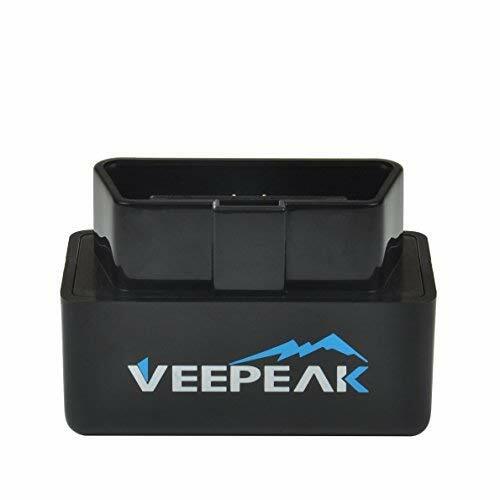 We used the DashCommand app for our iPhone, plugged in the Veepeak OBD2 scanner to the diagnostic port, and waited until the device was able to scan and read the fault code: it was a bad O2 sensor. No wonder the car was as thirsty as a camel. We thought it was just a dirty fuel injector! While we were working on it, we tested the real-time sensor data function of the Veepeak Mini Wi-Fi, and we were impressed. The graphs verified the faulty Oxygen sensor since the voltage readings were way off the mark. John’s Corolla definitely needs a tune-up, but the Veepeak was really impressive! Did we forget to tell you that this OBD2 code reader is less than $(see lowest price)? It’s definitely good value. The KitBest OBD2 Scanner is our replacement of choice for the outdated IdeaPro OBD2 scan tool. This scanner is designed to work on all 1996 and newer vehicles including light trucks, crossovers, and SUVs sold in the USA. 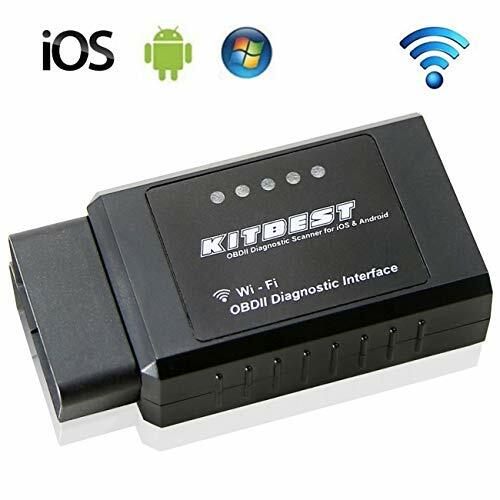 The KitBest OBD2 Scanner supports all five OBD2 protocols including CAN-BUS, KWP2000, ISO9141-2, J1850 VPW, and J1850 PWM. Because the KitBest offers multi-protocol support including CAN-BUS. It is safe to say that if your car is 1996 or older, then this device will work perfectly. Our Ford F-150 is a city truck. Jim is the owner of the truck, and he is not the outdoorsy type of person, if you know what we mean. His truck was having idling problems. We used the IDEAPRO Car Scanner to diagnose the fault. The results were conclusive: it was a bad throttle sensor. We were able to search for the meaning of the fault code from the KitBest database. This tool costs less than [check price] which makes it the cheapest OBD2 scanner for iOS devices. You can also use it to monitor and display current sensor data. It not only diagnosed and erased the check engine light on our F-150, but it did it without burning a hole in our pocket. If you want a cheap wireless OBD2 scanner that works on your iPhone, then the Panlong is the perfect candidate. It costs less than [see price] and will work on all 1996 to 2010 cars and light trucks sold in the USA. We had never heard of this brand until we did our testing. Hopefully, it didn’t disappoint. For the price and features, it could keep up with the thousand dollar Snap-on scanners we’ve used. If you have an older car (1994 to 1995) then this product may also work. We didn’t have the time to test this device on a pre-1996 vehicle, so we proceeded to diagnose our test Civic. The Panlong tool was able to scan and read the MAF sensor fault code of the Civic, but what puzzled us was that it didn’t read the Oxygen sensor fault code. This didn’t bother us at all, since we know that the sensor is not really bad yet, but it does have erroneous voltage readings from time to time. The important thing is that the Panlong adapter works, and it costs less than an oil change. The iPhone is a wonderful device. It does have a few caveats, and some people prefer using Android phones, but there is no denying the magic behind the engineering and expertise of Apple products in the tech and smartphone industry. Smartphones are so advanced that you can now use them to scan the CPU of your vehicle. You know that annoying check engine light in your dash? You need an OBDII scan tool find out what’s causing it. If you have an iPhone, then the hard part is over: all you need now is an on-board diagnostics scanner that is compatible with your iPhone. You don’t need to spend all your cash on this tool. The bad news is that there are a ton of OBD2 Wi-Fi scanners that you can buy online. The confusing variety makes it tricky to choose the best OBDII scanner for your iPhone. The good news is that the guys and I at ScannerAnswers have reviewed loads of these code readers, and filtered out the best OBD2 scanner for your iPhone. We have been getting a lot of questions about choosing the best OBD2 app for Apple/iPhone OBD2 adapters, and that prompted us to write a more comprehensive guide. Check out the OBD2 Apps guide here. That link above covers apps not only for iPhone, but Android and Windows phones and tablets as well. Check it out! Getting your own iPhone OBD2 scanner is a worthy investment, especially if you love cars. These awesome tools can diagnose and point you in the right direction for fixing most mechanical issues in your own garage, rather than spend chunks of cash at the dealership. Just the other day Matt’s sister had a CEL or check engine light illuminated in her Honda Odyssey. At first she was frantic. So she brought the minivan into the garage and we hooked up our BlueScanner. Within minutes we found that the DTC was only getting thrown because she forgot to fully tighten the gas cap! That trip to the mechanic could have cost over $50 bucks for such a simple fix! Whew that was a long post. I hope that you enjoyed our brief reviews and compilation of the top OBD2 iPhone scanners and code readers. Your iPhone is more powerful than the large computers of yesteryear. Why not use it as a diagnostic tool for your car? With any of these cheap, yet quality OBDII Wi-Fi scanners for the iPhone, you will not be disappointed! The best brief reviews and compilation of the top OBD2 iPhone scanners and code readers. Your iPhone is more powerful than the large computers of yesteryear. 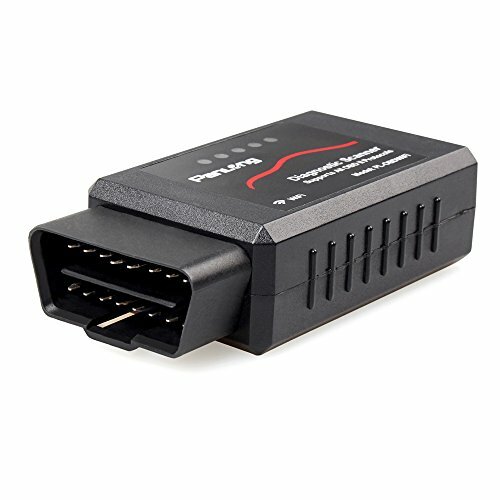 Why not use it as an OBD2 scanner for your car?